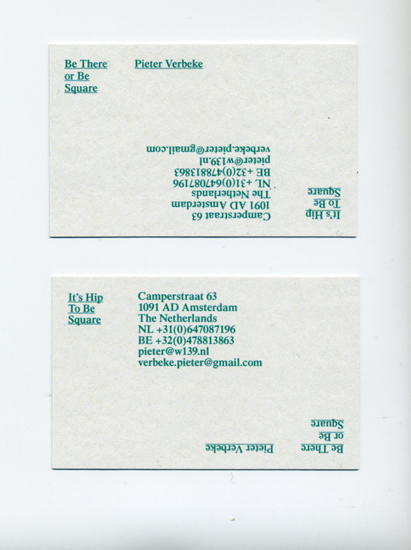 My friend Pieter said he needed a business card. Although he always claimed to be quite anti business cards, he said he needed some now anyway, since he was going on a trip to London planning to do some serious networking. I always loved the sentence Be There or Be Square and recently downloaded It's Hip To Be Square by Huey Lewis and the News. I just love how these two great onliners contradict each other, seriously. Funny thing about Pieter is that probably is the hippest square around. You'll see him at every social event, but if you ask him for his plans for the next night, he'll constantly answer you: I think I'll make it an early one, this time... But, he doesn't take it all too serious. And besides, we only printed a hundred of there cards. So, get to know this fella and make sure he gives you his card.